What’s more than one kilometre long, covers 7.7 hectares, holds 250 million litres of water, is as deep as 35 metres and is a beautiful turquoise colour? It’s the biggest swimming pool in the world. In case it’s hard to imagine just how much water that is, imagine a huge lagoon the size of 6,000 regular-sized pools. It’s a whopping 12 football fields long. 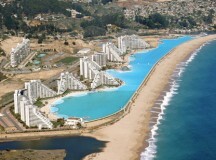 Located beside the ocean at a resort named San Alfonso del Mar in Algarrobo, Chile, it holds the Guinness record as the world’s largest swimming pool.